We want you to be completely satisfied with your purchase from us. 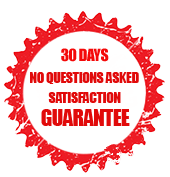 If you are not satisfied, you can return the product to MDFLY within 30 days of purchase for a store credit or refund. 1. Contact us via the form below or email us at questions@mdfly.com and request an RMA number. We will send you an RMA number and the return shipping address. 2. merchandise must be returned in the same package and same condition as you get it within 30 days after item shipped to your location. 1. A 15% restocking fee will be charged on return items due to customer error. 2. All parts must be returned with all accessories enclosed in the original packaging.